Atari was apparently pleased with the sales of the iCade controller it developed in conjunction with ThinkGeek. Now the classic gaming giant is introducing their own Duo Powered iPad controller. Atari is apparently working alongside Discovery Bay Games to develop, produce, and market the new joystick controller. Discovery Bay and Atari aren’t offering much in terms of information – just that the controller is coming soon. Neither company has listed a price. 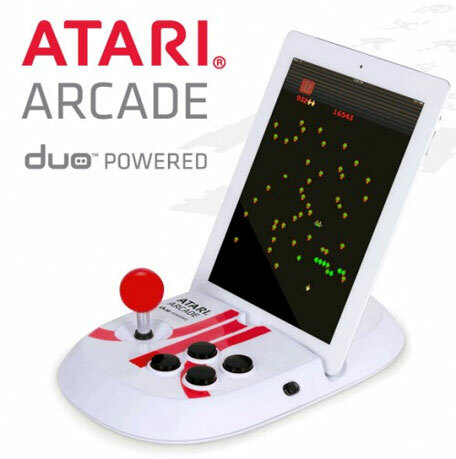 The controller is designed to work with the Atari’s Greatest Hits iPad app, which is available from the iOS App Store free of charge. While the ‘Greatest Hits’ App offers users access to more than a hundred Atari classics, users are required to purchase each game individually.